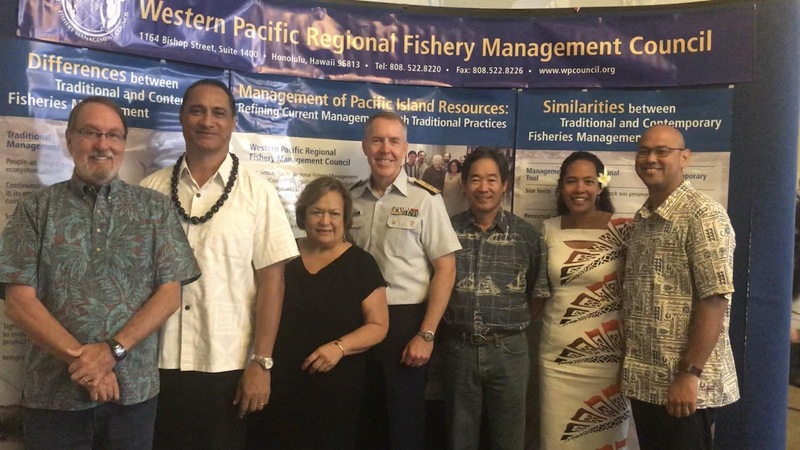 Executive Director Kitty Simonds (center) with WPRFMC members (from left) Vice Chair John Gourley (Northern Mariana Islands), Chair Archie Soliai (American Samoa), RAdm. Kevin Lunday (commander of the 14th US Coast Guard District) and Vice Chairs Dean Sensui (Hawai‘i), Christinne Lutu-Sanchez (American Samoa) and Michael Duenas (Guam). Federal fishery managers concluded their meeting in Honolulu today after dealing since Tuesday with a mixed bag of good and bad news about the future of fisheries in Hawai‘i and the US Pacific islands. On the good side, a 2018 stock assessment estimates the Hawai‘i Kona crabs maximum sustainable yield at 73,069 pounds. The fishery has reported catch below 3,000 pounds in 2015 and 2016, indicating the potential for a lot of growth. However, participants have left the fishery (which landed 70,000 pounds in the 1970s) since the State of Hawai‘i banned the retention of female Kona crabs. The Council recommended that the Hawai‘i Division of Aquatic Resources (DAR) record female crab and minimum size discards separately on the fisherman trip reports to provide a more comprehensive record of commercial catch. It also requested that DAR remove the statute that prohibits take of female Kona crabs and consider revised regulations to extend or shift the closed season to protect berried females. Other good news is that a recent economic report by the National Marine Fisheries Service (NMFS) found the Hawai‘i charter fishery generated close to $50 million in gross sales and supported nearly 900 jobs statewide in 2011. The Council encouraged NMFS to maintain a regular schedule of economic evaluations and monitoring of the fisheries in the Pacific islands. On the bleaker side, the Council discussed the ongoing UN Intergovernmental Conference on Biodiversity beyond National Jurisdiction (BBNJ), which is considering a framework to establish fishing closures on the high seas. The Council asked the Department of State, which has a non-voting representative on the Council, to exempt high seas fisheries targeting tuna and tuna-like species from any potential high seas closures established under the new BBNJ convention. About 70 percent of the fishing effort of the Hawai‘i based longline fishery is on the high seas.